1 Cherries Help You Sleep. 2 Cherries Help Fight Belly Fat. 3 Cherries Protect Against Diabetes. 4 Cherries Boost Cardiovascular Health. 5 Cherries Fight Against Skin Aging. 6 Cherries Cut the Risk of Stroke. 7 Cherries Protect Against Gout Attacks. 8 Cherries Have Anti-Cancer Properties. 9 Cherries Can Relieve Arthritis Symptoms. 10 Cherries Can Help Treat Muscle Pain. With more than 2,000,000 tons grown annually worldwide, cherries are a really popular sweet fruit. The production usually peaks in the summer because the majority of North American cherries are harvested in June. Cherries can be enjoyed raw, but are also often added to baked goods, pies, jellies, and jams for their sweet, delicious flavor. 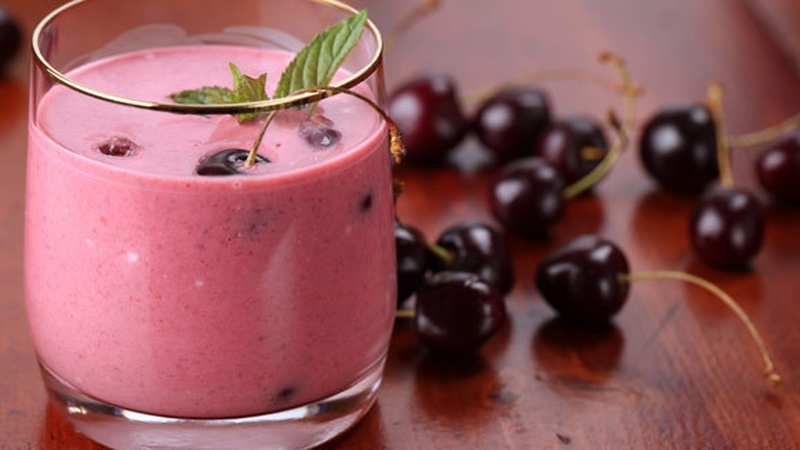 One of the tastiest and healthiest ways to consume cherries is by making a cherry smoothie. Here are some tasty cherry smoothies recipes to enjoy throughout the summer. The following cherry smoothie recipes include different ingredients that make various tastes. Try the one you like best and you can even create new ones by yourself. Just be daring and creative! As for making them, it is easy. Clean all ingredients and put them in the blender. If you think there are too big, just cut each ingredient into small pieces before blending. Cherries are rich in the hormone melatonin which is essential for maintaining the normal sleep-wake cycle. Patients who drank tart cherry juice have experienced improvement in both sleep quality and quantity. Cherries Help Fight Belly Fat. In rats on a high-fat diet, those who were fed additional whole tart cherry powder had lower weight gain and overall body fat than those who didn’t get the powder. Furthermore, they had reduced levels of triglycerides and inflammatory markers in the blood. Cherries are a great snack for those worried about blood sugar levels as they are slow at releasing sugar into the blood (i.e. a low glycemic index). In fact, cherries’ glycemic index is lower than those of plums, peaches, blueberries, grapes and apricots. Cherries are notably high in potassium, a mineral involved in controlling heart rate and blood pressure, and reducing hypertension. What’s more, the phytols in cherries help to lower the levels of damaging cholesterols. Cherries Fight Against Skin Aging. Cherries have high levels of antioxidants, such as anthocyanins and cyanidin, to defend our skin against free radicals which damage the collagen structure of skin, increasing the appearance of fine lines and wrinkles. Cherries Cut the Risk of Stroke. The anthocyanins in cherries may also activate peroxisome proliferator-activated receptors, which control genes associated with fat and glucose metabolism. Therefore, regularly eating cherries can reduce fatty deposits in the blood vessels, decreasing the chances of stroke. Cherries Protect Against Gout Attacks. Patients with gout experienced a 35% reduction in gout attacks after eating around 10-12 cherries every day. Scientists believe this is because cherries lower the amount of uric acid, a chemical that forms crystals in the joints leading to the attacks. Cherries are full of cancer-fighting molecules, including vitamin C, carotenoids, anthocyanins, cyanidins and fiber. Cyanidins in particular have been shown to stop cell growth and promote cell differentiation, which stops normal cells transforming into tumor cells. Cherries Can Relieve Arthritis Symptoms. It has been proved that many substances in cherries have anti-inflammatory properties. Regular eating of cherries can reduce inflammatory markers. The decrease in inflammation can ease the pain in inflammatory osteoarthritis, providing relief to patients. Cherries Can Help Treat Muscle Pain. Runners who drank cherry juice twice daily for a week before a race experienced less muscle pain than those who drank other fruit juices. It’s believed that muscle damage during exercise can be relieved by the antioxidant and anti-inflammatory chemicals in cherry juice. Server responsed at: 04/19/2019 4:29 a.m.